FROM RELIGIOUS ACTIVITIES AND STRUCTURAL PROGRAMMING? "Self Is The Blurred Veil That Hides The Face Of God From Us. He. The King of tranquility and Divine Purpose, has the place of Sanctuary carved out in a definite place.
" But the time is coming--it has, in fact, come--when what you're called will not matter and where you go to worship will not matter." "It's who you are and the way you live that count before God. Your worship must engage your spirit in the pursuit of truth. That's the kind of people the Father is out looking for: those who are simply and honestly themselves before him in their worship. God is sheer being itself--Spirit. Those who worship him must do it out of their very being, their spirits, their true selves, in adoration." 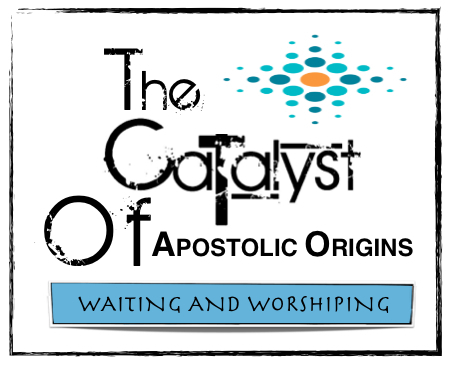 THE CATALYST OF APOSTOLIC ORIGINS BEGAN WITH A "PLACE" OF SANCTUARY. "Why are we here? What are we waiting for? Who is this all about?" WE ARE SIMPLY RESTING IN THE KNOWLEDGE THAT THE LORD HAS BROUGHT US TO END OF THE OF THE PAST WAYS AND FORMS OF MAN. He is preparing the way of His Power with a place of personal introspection and heart searching until we see that we must be truthful in our worship of Him. We must come into agreement with His Spirit and the way that He desires to move among those who know Him and among those who do not. nothing to take to task, nothing to self generate but only to "marinate" and saturate in, we see the promises He has made begin to be realized. All the fancy trappings of "noisy worship strategy" pale compared to this heavy rich perfumed presence that descends on those who will wait upon the Lord and grow stronger. There is no need for airy or trendy teachings and thoughts. No need for the pious and well versed to instruct in well-oiled speeches implying the way to go. ...He moves upon many within the Body to rise up and declare, to share, risk, expound and grow in the Grace of God, as well as in much Mercy. HEAVEN LONGS TO KISS THE EARTH AGAIN. The King of Heaven is descending with an unexplainable and definite wave of stillness. It is His manifested Presence. In His Presence. His Sanctuary. COME. LET US BE MAGNIFICENTLY WRAPPED UP IN HIM! Thus I have seen You in the sanctuary, To see Your power and Your glory." podcast link and website information for Mary Lindow is included. Thank You! Copyright © 2019 " THE MESSENGER "
And Assist Mary In Publishing Her Teaching Podcasts, Videos and Teaching.